Annual physical exams, performed at the time of vaccinations, are recommended to determine your pet’s health status. 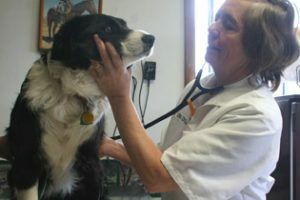 A physical exam gives the doctor a look into your pet’s mouth, ears, eyes and throat. The lymph nodes are all palpated for enlargement and the abdomen is felt for pain or abdominal masses. The pet is examined for lumps and skin conditions and the heart is ausculted to assure appropriate rate and rhythm. Pets five years of age and older should have blood work completed to evaluate organ function and blood cells. These results give veterinarians another tool to make the best medical decisions for the animals especially before administering anesthesia. Routine blood work can be completed right here in the clinic with our in-house Heska lab equipment.